sorry Lachie but it might not be so bad, no animation! so a few frames might be OK! its done the first stages! -UNWRAP_TILE.EXE makes the main 512x512 BMP into 16x16 bmp tiles for the utility. -the Template BMP is only a basic design for setting up Chipsets that use my Mapping AI. I'm going to add a few utilities! -also for FBGFX loading or OPENGL loading! -and a utility to choose loading mode fbgfx or openGL to walk around in! Hey, don't apologize man. At least you have a reason for using OpenGL (zooming in/out). I only wish you added a support for lower resolutions, because in this resolution it pretty much unusable on my PC. Pitty, because I was interested in those random generators. Well, I can read the code (can I?). Hopefully you'll do a FBGFX version soon. BTW, thought about adding an option for 3D view of the map? Well, maybe that's too much. It means that each tile would have to have an 3D object associated to it. This is already venturing into 3D scene generation. But I do remember someone doing this with an ASCII map editor. that would be possible doing a 3d version! 2d tiles x,z, 2d objects y,x! almost like Ragnarok but not as glorified! but i will lower the res see what i can do for ya! and um... the AI is very involved and some what rough for the tile cleaning! i can comment stuff later if ya want! as for a BFGFX this is a remake from my first FBGFX i can send you that file if you want! When I mentioned a 3D view of the map, I was basically thinking on a terrain maker that would read positions of 3D objects to be drawn from the map file, so you would have to have a 3D object created for each tile. 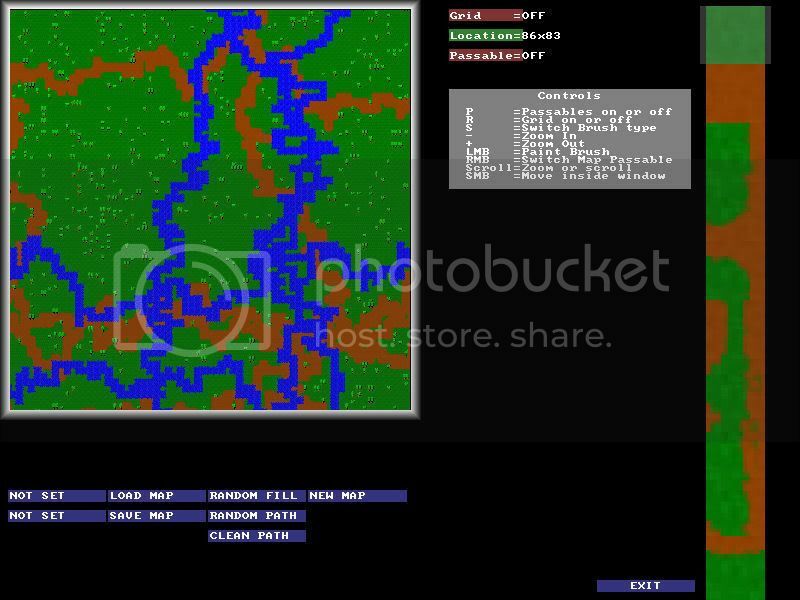 But maybe you could just add support for few grass tiles, few river tiles and few trees, so some simple generic forest settings could be generated. BTW, I prefer having a fully functionaly version of the map editor, but if the original FBGFX is not terribly crippled, email it to me. i found a site i guy did that! made 3d tiles, in Blender the used a map editor to compile a map for his RPG. ill try to find the sight it was extremely interesting, something id like to do! few chipsets Ive done its mostly there! here is one i made along time ago in QB it uses a 3x3 brush palette i liked for larger tile objects like big zelda type trees, buildings stuff like that! im contemplating on adding this feature to! if you want to look try it out to! i have added FBGFX_VIEWER to the files. this allows you to view/walk around your map. open EXE and type "test"
i have now added a reformat option and a main exe hub! that you only have to use/load tiles needed for the map! any unwanted tiles are not saves to the finished Directory, and they are renumbered for the map! ill work on a PDF now for this! the start as scripter if any one wants! but i figure script engines are to a point only for the operator, (what do i know)! Very nice. You know, the graphics you provided with this map editor really makes me wish you start some project using it. You got skill. And I see the water is animated. Anyway, good job on the PDF documentation. Only if you provided a FBGFX GUI. I just can't work in that OpenGL. if you really want to use this i will make a FBGFX_GUI! im thinking the "TALE of GRENDAL:A BEOWULF CHAPTER"